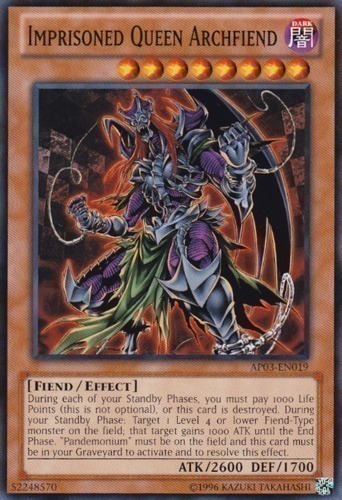 During each of your Standby Phases, you must pay 1000 Life Points (this is not optional), or this card is destroyed. During your Standby Phase: Target 1 Level 4 or lower Fiend-Type monster on the field; that target gains 1000 ATK until the End Phase. "Pandemonium" must be on the field and this card must be in your Graveyard to activate and to resolve this effect.